The Lunch Box is this week's featured site! TLB has been around for a long time and Turnip continues to make amazing graphics! Hello jessicaq978, and welcome to NEWS FLASH, an advertising and competition site run by Jessica! This is a place where you can advertise your site! Do you want your site to be discovered by other fellow neopians? Then go ahead and place an advertisement! Are you looking for new affiliates, listers, or sibling sites? Then be sure to check out the Searching For section! Don't forget to enter and vote in the SOTM competition ! You will definitely have an amazing time! News Flash also has other fabulous extras such as Site Rankings and Seasonal Festivals! If you are having trouble around the site, please let me know. I hope you will enjoy and be sure to keep checking back for more sitely news from all your favourite sites! 02) All sites and ads are welcome! 03) You DO NOT need an 88x31 link back button to place an ad. 04) Remember, you can submit an ad as many times as you want! There is NO LIMIT. 05) Lastly, PLEASE link back to News Flash with either one of my buttons, adding me to your "listers" section, or mentioning News Flash in one of your updates! this form and send it to me! please fill out this form and send it! Want a monthly advertisement in this slot? Then enter the Site Of The Month Competition! If you win, your button and advertisement will appear here. Tsunami is searching for a sister site! Please neomail me if you are interested! Must be a adoptables site! Welcome to the Site of the Month competition! This SOTM will accept a maximum of 8 sites! This competition does not award item prizes or neopoints! Winners of this competition will get a month long ad under "The Ads" section, and an award icon or button. But all participants receive a special gift aswell! 1. 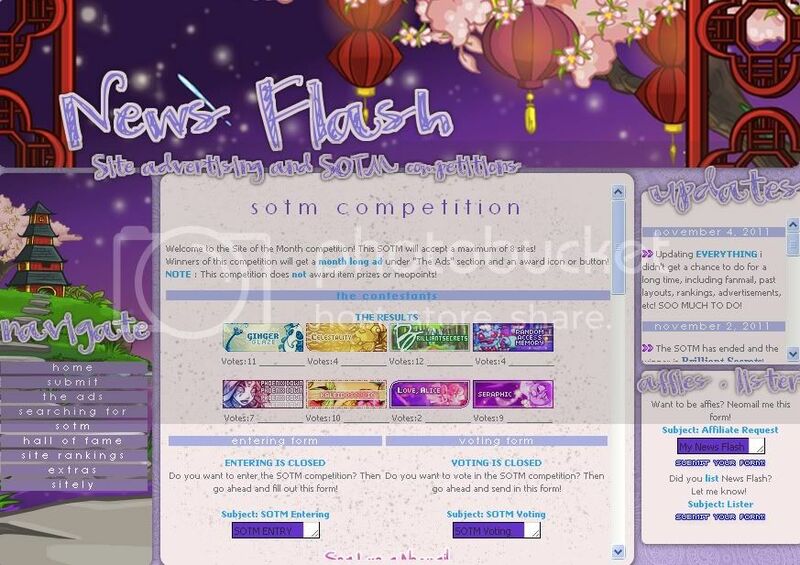 You MUST link back to News Flash BEFORE the sotm competition starts. If you don't, I may be forced to remove your site from the competition. 2. You cannot bribe, force, or neomail a bunch of people to vote for YOU ! You may neomail people, but please only tell them to vote for the site they think is the best! 3. If you lost the SOTM competiton, you may enter the next round. But if you won, please do not enter the next round! Please just wait for the round after. 4. You can enter multiple sites! 5. On the entry form, when I say neopets, you say spooky. 6. Please do not enter anything offsite or anything that does not follow the neopets rules! 1. You may vote for yourself, but only once per round ! And please do NOT vote for yourself again on side accounts! 2. Only vote when voting is open ! 3. You can only vote ONCE per round for 3 different sites. 4. On the voting form, when I say neopets, you say spooky. 5. If you are in the competition, you are still able to vote! Pre-entering is currently CLOSED! Didn't make it on time to enter the current SOTM competition? Want to have a guaranteed spot in the next competition? 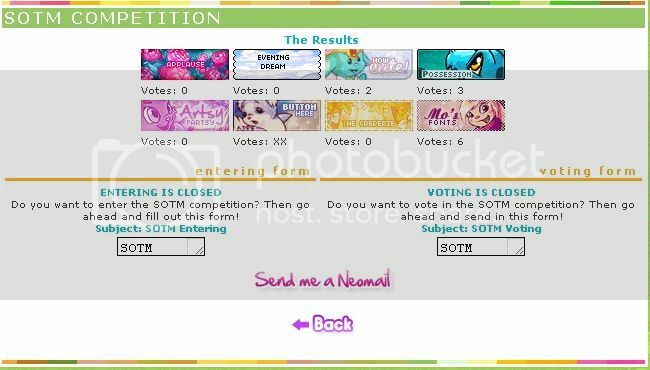 Then please read the rules and neomail me the regular entry form, but make the subject Pre-entering"! Welcome to the SOTM Hall Of Fame! All the winners, competitors, and voting results of all the past SOTM competitions are displayed here! Here are all the past SOTM competitions and voting results! The images are ordered from past to current. News Flash offers a big festival filled with fun events! Here I will list all of the top ranked sites in the site community! Come check out my daily updated blog! rankings, reviews, gifts, and more since its' opening! Welcome, jessicaq978 , to the site rankings section of News Flash! In this section, you will be able to view the best in the site community! (#1 is on the left etc.) Last Updated Rankings On: December 24, 2011 If you are ranked, please feel free to take an award! These are News Flash's awards & achievements! From the amazing msclvr33 @ The Paper Lantern for my birthday 2011! Sorry for leaving as soon as I came back! I really miss running News Flash but I always felt overwhelmed! So I have decided to re-open News Flash, but update less frequently, probably every other day. The SOTM and all advertisement sections are open! SO hurry before they close! Also, I don't know whats up in the site community! So please please send me neomails and let me know whats happening! And please let everyone know News Flash is Back! Want to link back to News Flash? Feel free to pick up a button! Are you in the SOTM contest? Then come pick up a "Vote For Me" button! If you placed an ad, feel free to link back with these buttons! Has you site been ranked at News Flash? Then pick up an award button here. Has you site been featured at News Flash? 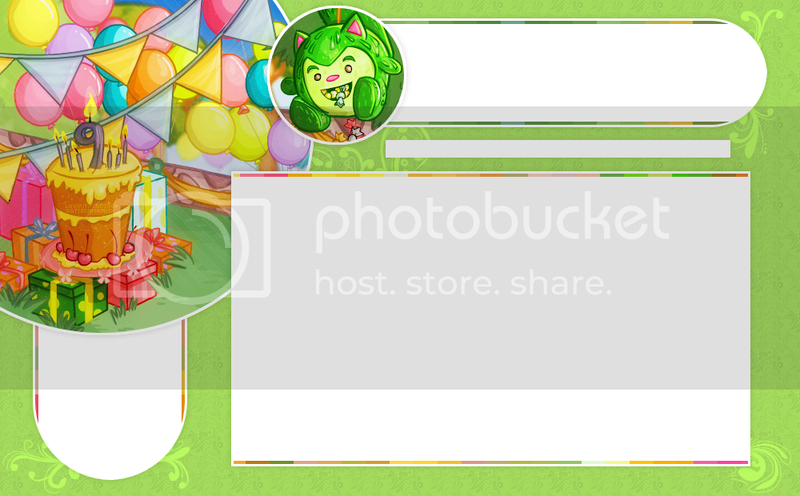 Then pick up an award button or icon here! Come check out the amazing sites that are affiliated with News Flash! These are the amazing directories that have listed News Flash! Come check out the great sites and people that have helped News Flash! Please neomail me the following form if you would like to be affiliates with News Flash! My News Flash Affiliate Application Name: Site Name: Site type: Site Link: How did you find News Flash? (optional): Anything else? : Thanks! Note: If your site is inactive for more than 3 weeks, i may remove you without warning! But feel free to reapply when you come back! DID YOU LIST NEWS FLASH? Did you list News Flash in your site/directory/etc? Then please neomail me the following form! News Flash, all content (unless stated otherwise), and original ideas are © jessicaq978 (me) as of September 2011. Not to be used without permission! Layouts Designs/Coding are © Seraphic. Textures/Brushes from dA and NR. jogglystrantensoreur @ The Soroptimist Directory for the "sitely news" idea! jaquie888 @ Kaleidoscopic for inspiring me to have an SOTM competition! NEOPETS, characters, logos, names and all related indicia are trademarks of Neopets, Inc.